jatirpita.net & sheikhmujiburrahman.com, all part of JoyBangla.net Network. This site is not party based, it is Bangla and Bangladeshi based, It is for people believe in Our Freedom, believe in Our father of the Nation! Our Brothers, Sisters, Mothers & Fathers dedicated their lives to get us this freedom, including Seven Bir Sreshtho,We honor them from Our heart, We honor our Father of the Nation, who has sacrificed his whole life to fight for our freedom. Please Send Your Articles, Stories, Poems related to Bangla, Bangladesh, Bangladesh Freedom fighting and Our Father of the nation. 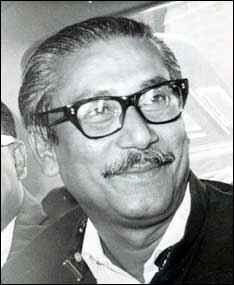 Sheikh Mujibur Rahman (March 17, 1920 – August 15, 1975), the founding father of Bangladesh. We honor you from our heart for sacrificing Your Life for Our Freedom. We Pray to God to give us Honesty, Dedication & strenghth to fulfill Your Dream, "Dream of Sonar Bangla".